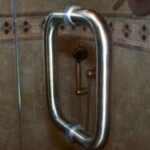 Our frameless shower door hardware is available in a variety of beautiful, consistent finishes. Let us show you physical samples of any finish and share the latest trends we are seeing with designers. MAXUM: With its clean lines and simple rectangular shape the MAXUM hinge is our most popular choice. It has an understated style that will not compete with your other bathroom hardware and fixtures. MAXUM is offered in a variety of styles, including wall mounted and glass-to-glass, for complete design flexibility. MAJESTIC: The MAJESTIC hinge is a stylistic variant of the MAXUM hinge, with the additional design elements of radius corners and beveled edges. Our high quality, “standard” frameless knobs and pulls provide a clean look at the best price. “Premium” knobs and pulls can give your enclosure a custom “one-of-a-kind” feel. Please inquire for pricing. 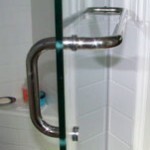 We have a large selection of towel bars designed for glass mounting on doors or fixed panels. There is a style to match most of our available knobs and pulls. 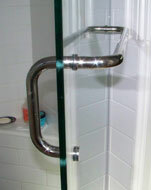 Our towel bars are available single sided, back to back, and towel bar/pull combos. Please inquire for pricing. 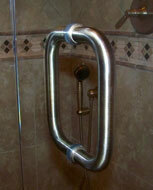 If your shower enclosure includes fixed, stationary panels, we offer two methods for attachment. Both are equally durable and water tight, but have different aesthetic and budgetary considerations. Option 1 – Clamps: Glass clamps are mounted directly to the wall or floor and screwed through a hole in the glass. The clamps would match the rounded or square style of your hinges. While this method avoids the use of u-channels, some enclosures can feel “cluttered” or “busy” if the configuration calls for an excessively high number of clamps. Option 2 – U-Channels: Fixed panels mounted in U-Channels provide clean, uninterrupted sight lines. And, because we do not have to drill holes in the glass, there is a cost savings we pass directly on to you! All Atlas Frameless Shower Door Hinges and components undergo strict quality-control measurements, testing and inspections and have been engineered to meet or exceed all industry standards. The hardware is covered by a limited 3-year guarantee against workmanship and manufacturing defects.